The kids were awesome and did such an incredible job of singing songs that they had only learned a few weeks ago. 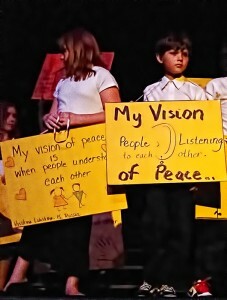 During one portion of the performance some of the kids displayed postcards from children around the world (age 6-12) to Oprah that depicted what their vision of peace is. If anyone thinks that kids around the world don’t know what issues we are facing today I direct them to the visions of peace above. For me, listening to these visions of peace further cemented the value of our sabbatical for our own kids. They are going to have the opportunity to experience another culture, learn a different language and communicate with people that are different from them. I hope they discover on their own that despite our differences we are very much the same. We all have the same needs, the same desires and the same dreams. The world is our classroom, we just need to get out there and attend class and that is exactly what we intend to do. What is your vision of peace? What can you do today to create that vision in the world? Leave your thoughts and comments below. Let’s see if we can’t turn this into a great conversation on what we can do to further the message of peace throughout the world. My vision of peace is one where intolerance and social injustice are things of the past. Where clean water and medical treatment are human rights and everyone has food on their table. Where people have the ability to freely travel between countries, meet their world neighbors, share a meal and a story and celebrate life together. And free ice cream for everyone! Now it’s your turn. What’s your vision of peace? very awesome matt :)..this is why I love being around kids…my whole aim has been to gain my own wisdom and regain my childhood innocence…if we can all become more childlike the world will be a better place…my vision of peace is that everyone one day discovers the inner peace that has always been there inside them…just need to do a little digging…if everyone can live and act from that place naturally the outside world will change…. Ivan, I couldn’t agree more. Now that I have kids of my own and they have reached an age where they are starting to explore the world around them I have to admit that they have taught me a lot. And I don’t think they are things that I didn’t already know but things that have become lost over the years as we become assimilated into adult society. I love that you are striving to regain that childhood innocence. If we all could look at the world again with child-like eyes I can imagine a much better world. I love your vision of peace and it’s something I hope to discover during my sabbatical. Hope to see you somewhere on the road this next year. Be well my friend and thanks for your thoughts here. How inspiring! Okay, here goes… a world where differences are valued and accepted, and no fear of the foreign. Oh, and everything you said too! Mary, I love it!! People tend to react out of fear of things that they don’t understand. But kids are often inquisitive, questioning and want to know more and learn more. We should all explore the world more, try new things and like you say here embrace differences and celebrate them. I love the journey you are on! I hope our paths will cross one day.